For 10 years, we've been the leader for wooden skateboard ramp manufacturing. 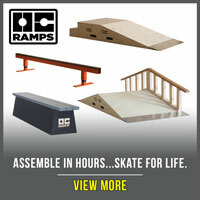 We ship skate ramps in the kits form all over the world. We have ramps starting at $149 and go to $10,000+. The average sale is roughly $1,100. Whats great about our site, is that we offer FREE shipping on most items-- making it extremely easy for the buyer to purchase on our website without fear of high shipping costs due to our large product sizes. Our company began in California in 2005. We've built ramps for everyone you can think of; Apple, Red Bull, Fox Studios, Lil Wayne, movie production etc. Our products and customer service is top notch. Have you used the OC RAMPS, Inc? Share your review!